Numerous studies have shown that mindfulness-based interventions contribute to a variety of positive outcomes in physical, cognitive, and affective domains. Less is known about how mindfulness influences variables associated with close interpersonal relationships. The present study evaluated a novel mindfulness-based intervention for promoting cognitive-emotional processes that are underdeveloped in people who have experienced unhealthy attachment relationships. 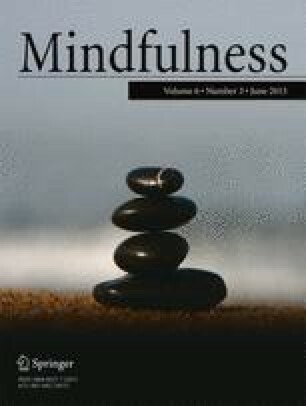 In a sample of women who were mistreated in childhood, baseline measures confirmed that attachment anxiety was related to rumination and negative emotion; attachment avoidance was related to emotion suppression and lack of emotional clarity; and both kinds of insecurity were related to emotion dysregulation and lower levels of mindfulness. Across three measurement periods, a treatment group (N = 17), relative to a wait-list control group (N = 22), evinced significant improvements in the domains of rumination, emotion suppression, clarity of emotions, emotion regulation, and mindfulness. A multiple mediation analysis showed that, of these variables, improvements in rumination and emotional clarity mediated the gains in mindfulness for the treatment group. Also, participants in the treatment group showed significant changes in their use of mindfulness-based language when writing about stressful or traumatic childhood attachment experiences. Taken together, the results suggest that the intervention led to increases in mindfulness, primarily due to decreased rumination and increased emotional clarity, and these treatment-related changes were specifically related to participants’ thoughts and emotions regarding attachment. This research was funded by a research grant from the International Society for Traumatic Stress Studies and with generous support from The Meadows of Wickenburg Inc. We kindly thank Elijah J. Bedrosian and Jennifer Noto for co-facilitating the REAC2H program, Morgan Day for administrative support, Cheryl Caldwell for her contributions to program development, and the courageous women who participated in this research. Pennebaker, J. W. (1994). Hints on running a writing experiment. Unpublished manual. Retrieved from http://homepage.psy.utexas.edu/homepage/faculty/Pennebaker/Reprints/Hints.doc. Accessed 7 July 2013. U.S. Department of Health and Human Services, Administration for Children and Families, Administration on Children, Youth and Families, Children’s Bureau. (2011). Child Maltreatment 2010. Retrieved from http://www.acf.hhs.gov/programs/cb/stats_research/index.htm#can. Accessed 22 Aug 2012.